The inaugural meeting of the UC-CSU Knowledge Action Network for Transformative Climate and Sustainability Education and Action will take place at CSUN on March 27-28. Photo by Lee Choo. 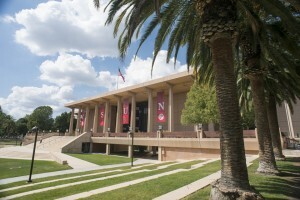 Hoping to tap into the brain power of the California State University and University of California systems and the creative imaginations of members of the community, California State University, Northridge will host a two-day workshop later this month to explore new ways to tackle the issues raised by climate change. The inaugural meeting of the UC-CSU Knowledge Action Network for Transformative Climate and Sustainability Education and Action will take place on March 27-28 in CSUN’s Jerome Richfield Hall, Room 153, located on the west side of the campus at 18111 Nordhoff St. in Northridge. The Knowledge Action Network is a collaborative effort by UC and CSU educators to scale and intensify California students’ literacy in climate change, climate justice, carbon neutrality/greenhouse gas emissions reductions and sustainability. Both systems have placed an emphasis on sustainability education, community-engaged scholarship and carbon neutrality in recent years. Organizers of the network said they want to merge those efforts for the mutual advantage of California students. Among those taking part in the inaugural meeting will be faculty from Cal State Los Angeles and UC Santa Barbara, as well as CSUN. Ruiz said members of the community, including Parent Pioneers and Pacoima Beautiful, also have been invited to attend. Ruiz said participants will spend the two days networking and strategizing about realistic approaches to encourage environmental resilience. For more information about the workshop, contact CSUN’s Department of Chicana and Chicano Studies at (818) 677-7355.